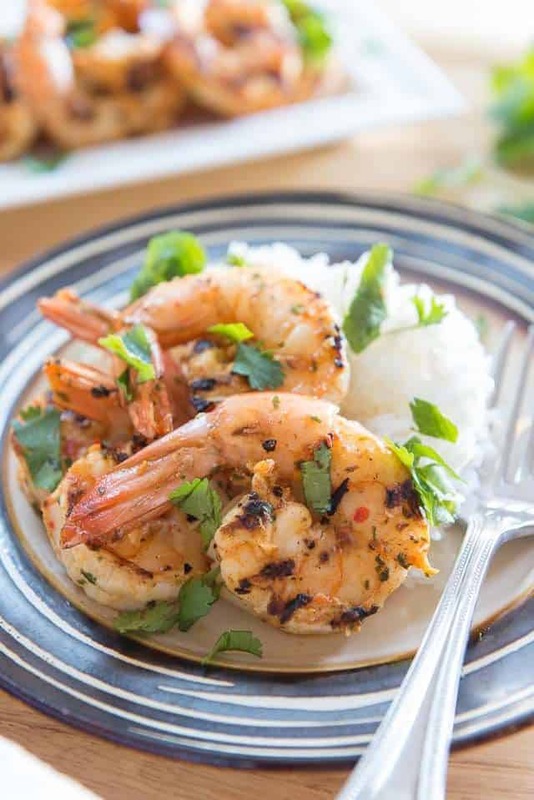 This Chipotle Shrimp has SO much flavor and cooks in a flash! 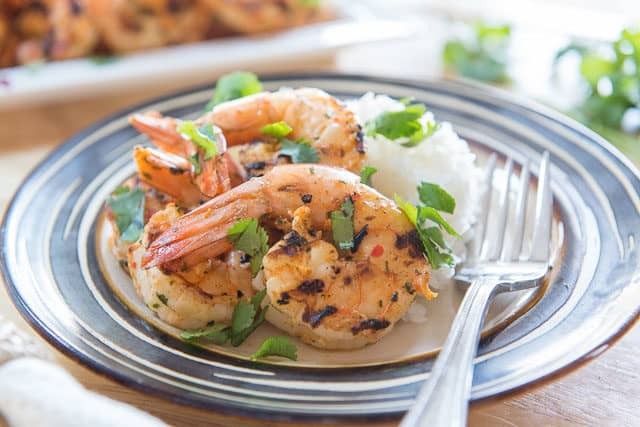 Peeled shrimp are quickly marinated in a fresh cilantro chipotle mixture, then cooked on the grill for a charred flavor. You can also sear the shrimp in a hot skillet. Among my many missions in life, I’m determined for people to know just how dang delicious chipotle is. Seriously, chipotle is one of the most flavorful ingredients on the planet and any time I cook with it, I always make something that I really enjoy. And I love that it’s always ready for me in the pantry! I remember I was really surprised when I first discovered that chipotle is just smoked, dried jalapeños. Sure, I can taste some similarities between the two, but each have such a distinct flavor. Fresh jalapeños are spicy, but have that vegetal quality to them. 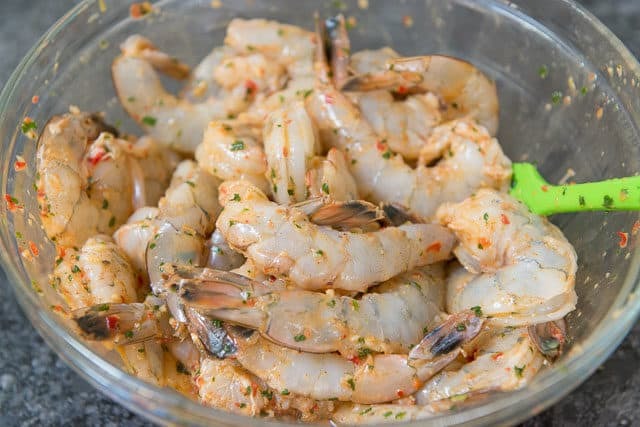 That disappears with the chipotle, and mostly you get a smoky and spicy flavor that works beautifully for today’s shrimp marinade, but is also incredible with cheese dips, corn, chicken, fish, and beef. (For salmon, see these Chipotle Sweet Potato Salmon Cakes, for corn see Chipotle Lime Corn on the Cob and Mexican Corn Salad, and for beef see this Slow Cooker Shredded Mexican Beef). As far as buying chipotle, you can get whole peppers in the can via “chipotles in adobo sauce,” but I prefer using the dry, ground chipotle that comes in the spice bottles like chili powder, cumin, etc. Red fresnos are also called red jalapeños, and they are the base ingredient for sriracha sauce. If you can’t find a red fresno, feel free to use a green jalapeño or serrano pepper. By the way…the marinade tastes so good! I always want to keep tasting it with a spoon. I like to leave the tail on for the look of it, but you can peel those off ahead of time if you want easier eating. Marinade the shrimp for 30 minutes in the fridge (I’ve gotten away with 15 in a hurry), but not any longer than that. 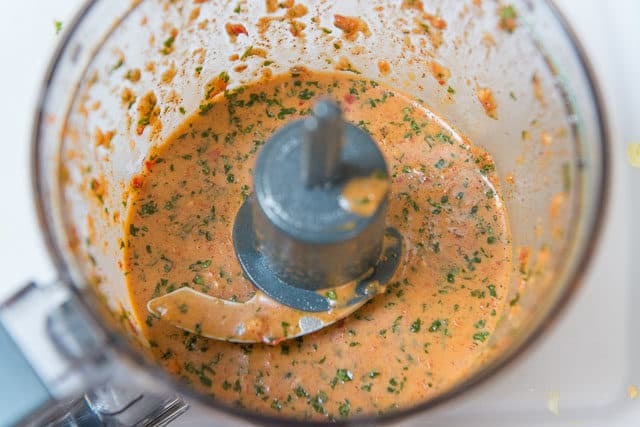 Seafood can’t marinade as long as meats, and the acid in the marinade will start to break down the shrimp and give it a mushy texture if you marinate much longer than 30 minutes. Next, heat a grill over medium high heat. It was a Christmas gift from my Father In Law last year, and admittedly it’s probably not something I would’ve ever bought myself because I didn’t think it could possibly impart much grill flavor. Well, I’ve been proven wrong. I was SHOCKED at how much char flavor it gives anything I cook on it though, and I definitely recommend it if you want to grill inside. You can also sear the shrimp in a hot cast iron skillet if you prefer, just about a minute on each side, until the shrimp goes from gray/translucent to a light pink. Sprinkle extra cilantro on top when it’s done, and plate it with your preferred side. The shrimp goes well with rice, but can also serve the chipotle shrimp with this Mexican Corn Salad, Quinoa Cakes, and these Zucchini Fritters. 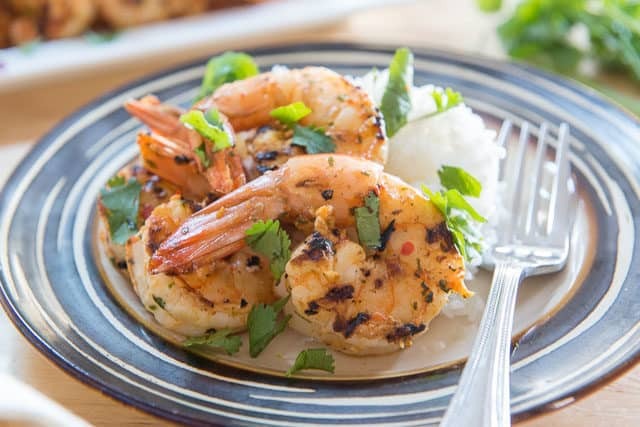 This grilled Chipotle Shrimp dish has SO much flavor and cooks up in a flash! 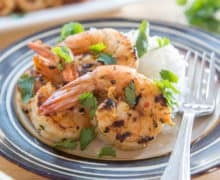 Peeled shrimp are quickly marinated in a fresh cilantro chipotle mixture, then cooked on the grill for a charred flavor. 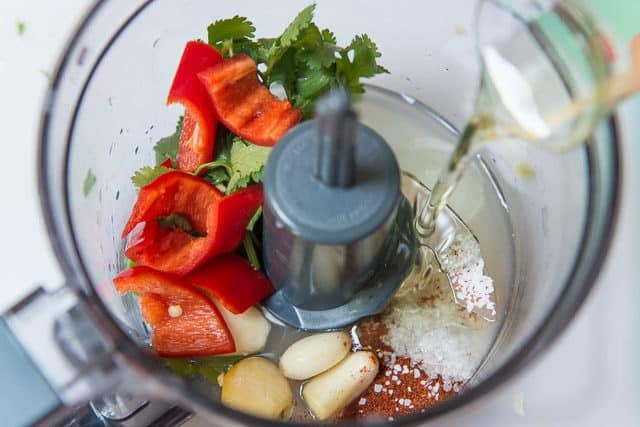 In a food processor, blend together the cilantro, garlic, lime juice, chile, chipotle powder, oil, and salt, until smooth, about 60 seconds. Place the marinade in a bowl and add the shrimp. Toss to coat. Marinate the shrimp for 30 minutes (or 15 if you're in a hurry). Make sure not to do longer than that, or the marinade will start to affect the texture of the shrimp and make it mushy. 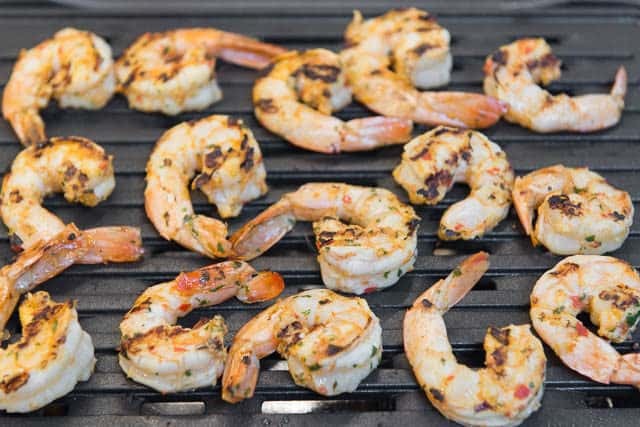 Heat a grill** over medium high heat, and cook the shrimp for about 1 minute on each side, until cooked through. The shrimp will turn from a translucent/gray color to pink when they're cooked through. You can also sear the shrimp in a hot nonstick skillet if you prefer. 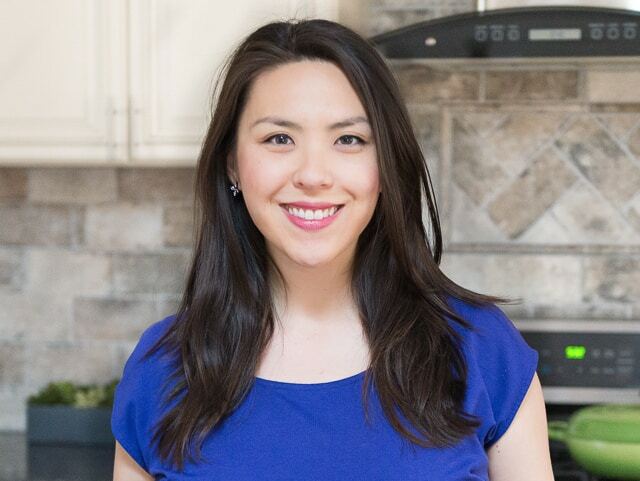 *Cook time varies depending on the size of the shrimp and how hot your stovetop/grill is. You're looking for the shrimp to turn from a translucent/gray color to light pink, and the shrimp should feel firm when pressed with your finger. You can always cut open too, to see if it's cooked through. **In the winter months, I use this indoor grill. I was pleasantly surprised at how much char flavor it gives anything I cook on it, and it plugs right into an electrical outlet. Leftovers will keep for 2-3 days. Post updated in February 2019. Originally published March 2018. Made this last night because I had all the ingredients on hand. Delicious and so easy! Will make again.